Are you someone who is eyeing a career in the medical field? Perhaps to become a medical representative or medical technologist? You have come to the right website. 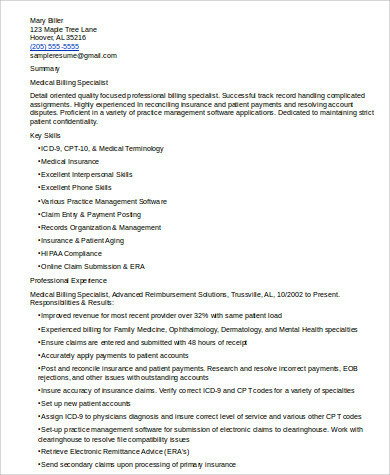 Here we have eight medical Sample Resumes that you can look into. With a wide variety of samples to choose from, you will surely be able to pick one that you like best. The medical industry is full of other careers aside from the typical nurses and doctors. These samples are all great as they all come in formats that are easy to edit and use as a guide. Take a look at all of our samples below. The say that an HR personnel will only look at your resume for 30 seconds. While this may be true for other fields, it is not true for those who are in the medical field since you need an extensive set of skills before you will be considered for a profession in the industry. Doctors. If you are vying for a position as a doctor, you will most likely be interviewed by a panel or the hospital’s board of directors. They will usually read your resume from top to bottom, so you really need to put emphasis on all of your awards, achievements, and certifications. These should all be written in detail. Nurses. As a nurse, you must be able to emphasize your diversity and your capability for being able to handle situations that may bring stress and pressure. You will be considered valuable if you are able to think outside of the box for the doctor. 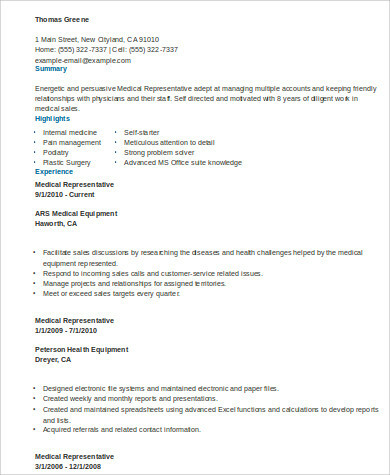 Medical Representative. Although a medical representative does not need a medical degree, you should still be able to work under a lot of pressure. You will also serve as the contact point of medical companies to health-care providers, so a little knowledge about medicine wouldn’t hurt. 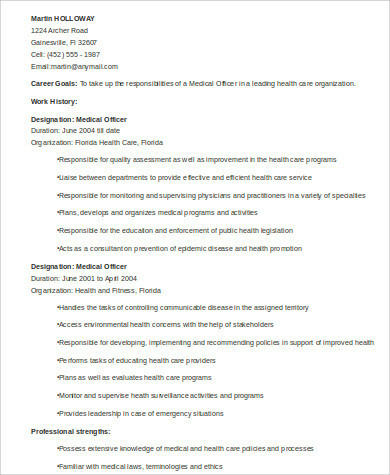 You may want to check out Medical Receptionist Resumes for a career in the medical industry that does not need a degree in the medical field. 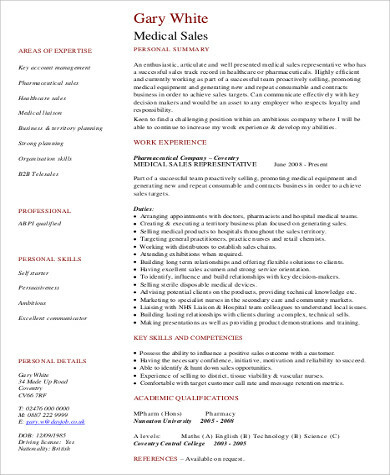 Do not hesitate to check out other resume formats at Resume Format Examples. 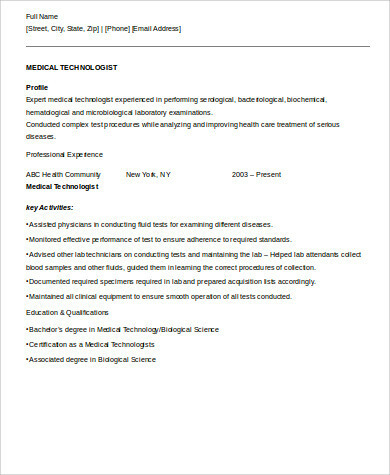 The medical resumes that are featured in this article can be used by people who are looking for jobs related to the medical field. You will not pay anything when you decide to download any of our available samples. There are eight sample resumes that you can choose from and they all come in various designs, outlines, and formats. These templates can be downloaded Word Document file format, which makes editing and saving to your devices easy as pie. 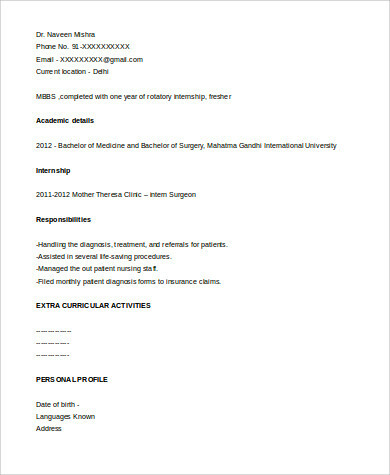 You can easily copy the format of your chosen template when you are making your own medical resume. You can change a some of the words and add some of your own to match it with your own set of skills and qualifications. 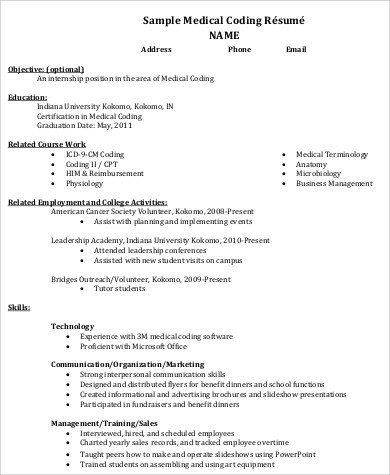 Medical resumes need to be written with precision, just like a management resume. All of your details must be presented. All of our samples will ensure that you will not miss any of the important details needed for your resume. 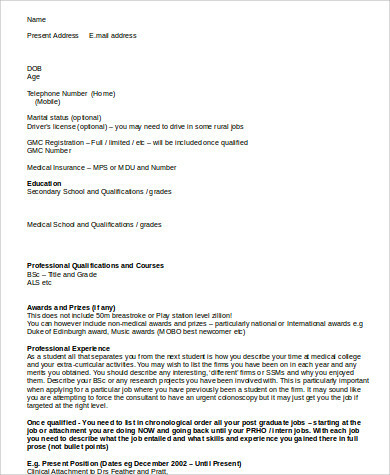 Start making your very own medical resume now! 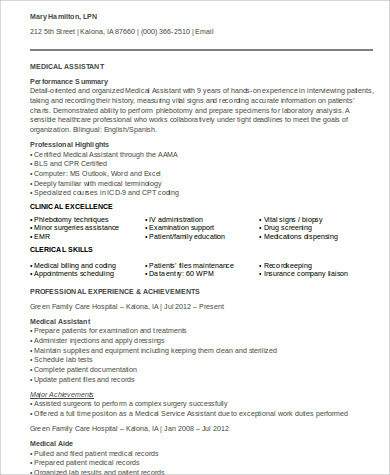 You may check out our Medical Assistant Resumes to see an example of a medical resume.